(SPOILERS) The unqualified success of Trainspotting foisted upon Irvin Welsh a certain cinematic cachet, but not of the positive variety. Any subsequent attempts to adapt his novels appeared to confirm that Danny Boyle’s sophomore zeitgeist-seizing movie was the exception that proved the rule. Welsh’s work was just too difficult, unruly and controversy baiting to translate to the silver screen with any degree of coherence and fetid lustre intact. That is, until Filth came along. Generally regarded as one of his least filmable novels (which is saying something), it arrived to generally favourable reviews if not massive audience response. It’s telling, though, that the glue holding the picture together is not any sense of nascent auteurism on the part of writer/director John S Baird. Rather it’s the central performance of James McAvoy, who lends his loathsome misanthrope sufficient charm and tortured soul that we’re willing to stick with him. The great achievement of Boyle and screenplay writer John Hodge with Trainspotting was not only in making the unpalatable palatable (and doing so without diminishing the impact of its least viewer-friendly elements) but in foresting a coherent narrative on a fragmented and episodic novel. Trainspotting remains highly episodic as a movie, but Boyle fuses the disparate elements together through a combination of tone, music and (all-importantly) narration. Whether consciously or otherwise, Baird repeats at least two of these devices. In Clint Mansell he has a master-musician attending to the soundtrack, and as a result the tonal shifts (and the main theme for Detective Sergeant Bruce Robertson – McAvoy) are aurally attuned. So too, Robertson’s conversational voice over has the casually informative tone that invites acceptance of whatever horrendous misdeed he is about to perpetrate next (it should probably have been a clue that there is only one other voice over in the movie but, while I was halfway there, I didn’t put it all together). Where Baird slips up is that he doesn’t quite nail the tone, at least until it’s too late. Trainspotting’s apparently random incidents fused together thanks to Renton’s overriding perspective, and his reflection included pathos amid the caustic recollections. Baird is unable to bridge his empathic gap with sufficient sureness. 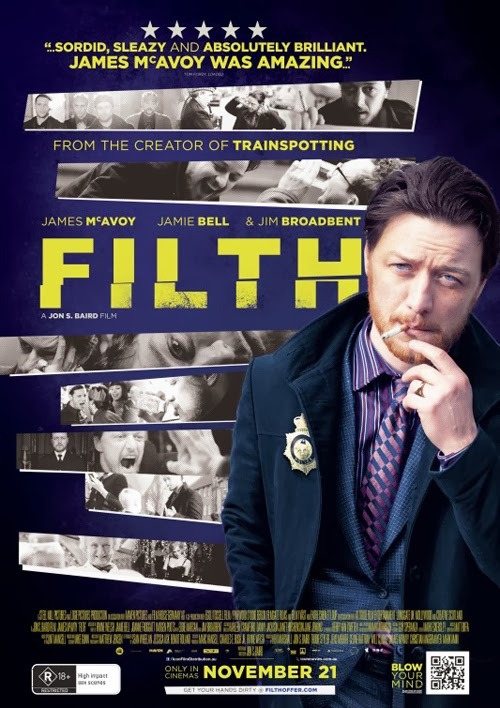 Perhaps part of this is down to the autobiographical nature of Welsh’s heroin novel; Filth feels like an invention, transferring the addict protagonist to a classic genre setting (the crime novel) and giving him some classic demons to battle (his family has left him, he has a dark secret in his past). It might be the intention to gleefully smear faeces over detective conventions, and in part this works well, but we’ve seen bad guy cops at work many times before, often extremely humorously. As a result any shock value is essentially limited. What Baird needs desperately is for Filth to flow, and unfortunately McAvoy’s narrative confidentiality can’t paper over the cracks in his director’s technique. What’s frustrating about Filth is that it’s so close to achieving what it aims for, but in the end the distance it fails to cover is crucial. Bruce introduces us to a motley assortment of fellow officers, all of whom may have an interest in an inspector position up for grabs; the increasingly ubiquitous Imogen Poots as a career minded female officer whom Robertson sees as shagging her way to the top (it couldn’t just be that she’s good at her job; she’s a woman), the almost as ever-present Jamie Bell (something of a protégée with a coke habit and a small winky), metro-sexual Emun Elliott (whose sexuality Bruce casts aspersions on at every opportunity), Gary Lewis’ dense old duffer and Brian McCardle’s fists-first fascist whose wife (Kate Dickie) Bruce is seeing. Bruce introduces each with a relentlessly malignant summary and inveigles us in his mission to undermine each in turn, so as to increase his chances of securing promotion. Then there's the main object of Bruce’s dyspeptic bullying; poor Clifford Blades (Eddie Marsan, so meek and mild it makes his performance in The World’s End looks aggressive). Bruce, in spite or perhaps because of repeatedly emphasised erectile dysfunction, is attending to any woman who crosses his path by foul means or fouler. So he harasses Clifford’s wife Bunty with a series of prank calls posing as Frank Sidebottom (the scenes of Bruce watching Frank’s TV show are an instance where Baird achieves a kind of nightmarish grandeur, although nothing here comes close to the trippy visuals in Boyle’s Welsh adaptation). Also notable from the Clifford subplot (and those with Bruce’s boss, played by John Sessions) is Filth’s disenchanted depiction of freemasonry. I’m trying to think of films that have had much to say on the subject (perhaps no one wants to offend, as you never know when you might get on the wrong side of a financier?) The best I can come up with is The Man Who Would Be King, which takes a most definitely benign view of the organisation. Here, the epithet “brother” is intended to suggest nothing of the sort and, as many conceive of those who join a lodge, Bruce is only a member so he can get ahead. The cruelties Bruce inflicts on Clifford are so irredeemable, it’s only his final admission that the the latter is Bruce’s only friend that goes some way to diffuse his behaviour. During all of this we are witness to his increasing affliction with substance abuse, as Bruce spirals out of the control he is attempting to grasp. Baird never quite gets a handle on how to integrate this. We see Bruce’s hallucinations of those he knows in totemic animal form, but rendered as run-of-the-mill prosthetic appliances. The tapeworm gnawing away at his insides is visualised so clumsily it would have been best to excise it all together; Jim Broadbent’s doctor becomes his nagging inner voice in hectoring and ill-judged dream sequences. Then there’s David Soul’s singing taxi driver; a nice idea, but the execution just makes it seem random. Baird clearly has more than enough ideas, but probably needed a collaborator to help him refine them. The director also has abundant energy, but he is too scattershot too frequently. Ironically, it is only during the last 20 minutes that he becomes more focused. Ironically, as this section is much straighter than the preceding episodes. The narratively rather tidy and far-fetched solution to the missing murder witness is revealed as Bruce himself; he has been indulging in a spot of transvestism, assuming the identity of the wife who has left him. It was in this state of apparel that he came across the gang attacking a Japanese student in the opening scene. This has the over-the-top quality of Michael Caine in Dressed to Kill, but the ever-reliable McAvoy manages to sell it (although changing the race of the murder victim, and the perpetrator, from the novel appears to be a calculated decision to make Bruce slightly less odious; even not having read it, I was expecting to find that Bruce - or his Lady Macbeth wife – had some yet to be revealed conspiratorial involvement in perpetrating the deed). Bruce facing up to his inner torment requires Baird to veer away from attention grabbing vignettes. As a result some of the wittiest scenes in the movie emerge; Bell’s now promoted inspector telling the shrivelled Bruce how it is, and the final magnificent bad-taste twist as the grieving Mary (Joanne Froggatt) calls round just as he is about to hang himself. His convivial “Same rules apply” is just the sureness of tone Baird needed throughout. Despite the issues with the telling, what works works very well. Bruce’s vile bile is frequently very funny, and his asides or looks to camera are just the kind of approach that works for this larger-than-life kind of material. The dry self-mockery that informs the opening address (“It is great being Scottish. We’re such a uniquely successful race”), followed by Bruce stealing a child’s balloon, sets the scene more assuredly than what follows. Even if elements contribute nothing, they are often amusing; Session’s boss is obsessed with selling a Hollywood screenplay, and we see him reading a copy of The Writer’s Guide at one point. No doubt Baird consulted it to stress some of the less daring aspects of Filth. For all that it wants to be provocative, it actually isn’t very. Sessions also gets one of the best lines (“Not only is there a latent Nazi racist homophobe but a bloody Jessie Boy after the inspector’s job”). Apparently Sessions walked out of the premier, as it wasn’t his cup of tea. Presumably he did that actor’s thing of only reading his scenes before taking the part. Filth’s a worthy try, then. McAvoy is superb (and the supporting players are all note-perfect). He delivers every self-destructive, vindictive and comic episode with gusto, well aware that roles like this don’t come along every day. He’s better than the movie, unfortunately. One only has to look at the advertising campaign to see how uncertain everyone seems to have been about what this was (Bruce, dressed in policeman’s uniform, riding variously a pig and a whisky bottle). It looks desperate, frankly, and entirely clueless over how to get unconvinced potential audiences to attend. The film itself is considerably better than that, but may be a lesson in the need to wring changes further than Baird was prepared to; perhaps if he had he still wouldn’t have made the next Trainspotting but a picture trying less hard to satisfy too many parties. One thing about it, it’s an even less Chrissmassy Christmas movie than Bad Santa.